A selected set of statistically downscaled climate and hydrologic projections for the Western US, from the Pacific coast to about 103°W, implemented at a daily temporal resolution and a spatial resolution of 1/16th degree (~30 km2). The selected set of projections, derived from the CMIP3 global model archive for the A1B scenario, include an average of the 10 best global models, along with four bracketing models that span the range of temperature and precipitation projections. Climate information is a key component of prioritizing adaptation actions and conducting vulnerability assessments. Despite the increasing availability of climate information in the Western United States, a consistent set of hydro-climatic projections for the region at large is lacking. Furthermore, managers require information on the uncertainty in climate projections, in particular for changes in climatic extremes, which affect aquatic and terrestrial ecosystem vulnerability. The goal of this project is to address these needs. Figure 1. Study domain and five major basins in the Western U.S. The hydro-climatic projections generated from this study support a wide array of applications. The products are designed to accommodate various spatial scales and include variables that are directly relevant to changing hydrology and ecosystem health. One example of application is a study evaluating the implications of climate change for Wolverine (Gulo gulo) habitat. In this study, McKelvey et al. (2011) used the changes in temperature and snow to project a contraction of denning habitat and habitat connectivity for wolverines (Figure 2, left for the historical and Figure 3, right projected for the 2080s). Figure 2. Historical wolverine habitat (in black) based on historical snowpack accumulation over the Western US (left). Projected areas of suitable habitat for wolverines (right) as a result of snowpack loss by the 2080s (an average of 63% reduction in habitat). Figure source: McKelvey et al. 2011. We analyzed global climate models (GCMs) available from the CMIP3 projections (used in the IPCC AR4 report to better understand the projected future climate by region and individual model sensitivities within regions. We then developed an ensemble of the ten best climate models, based on eliminating the worst-performing models in each of the 6 major regions within the domain (Columbia, Upper Missouri, Upper Colorado, Lower Colorado, Great Basin, and California). Downscaled projections were produced using a simple “modified delta method” statistical downscaling approach (see Littell et al., 2011). Projections were obtained for the ensemble average of the ten best climate models (“composite”), as well as for four bracketing models. Bracketing scenarios were chosen to span the range from cooler/drier (less winter flooding) to warmer/wetter (more winter flooding) and from cooler/wetter (less summer drought) to warmer/drier (more summer drought) — i.e., spanning the four “corners” of changes in temperature and precipitation. 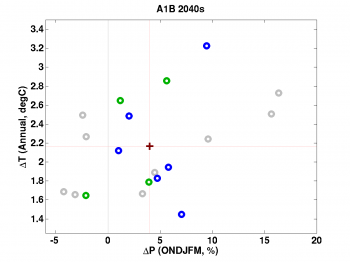 Figure 2 shows the projected changes for all CMIP3 models, and highlights the changes for the 10 models included in the ensemble, as well as the 4 bracketing models.In addition to the statistically downscaled results, we included one dynamically downscaled scenario in the analysis for this project. Dynamical downscaling is performed by running a regional climate model with boundary conditions taken from the global model being downscaled. In this case, the Weather Research and Forecasting (WRF) regional model was run using boundary conditions from the ECHAM5 global model and SRES A1B emissions scenario. The WRF model has been implemented as a regional climate model over the northwest United States at 12 km grid spacing (see Salathé et al., 2010 and Salathé et al., 2013 for details). Climate simulations were performed using an inner grid resolution of 12-km over the Pacific Northwest and a 100-year (1970-2070) simulation. For this dataset, we used simulated WRF daily output of total precipitation, maximum and minimum temperature, and mean wind speed. Although regional scale climate models represent the important topographic features of the PNW and the mesoscale structure of storms that control flooding in PNW rivers better than global models, RCM simulations are still subject to substantial biases resulting from deficiencies in both the global forcing fields and the regional model (Wood et al. 2004; Christensen et al., 2008). To obtain acceptable hydrologic simulations, these biases must be removed when using RCM results in impacts studies. In addition, to link the WRF results to the VIC hydrologic model, the simulations require additional downscaling from the 12 km WRF grid to the final 1/16th degree grid. Figure 3. Precipitation (Oct-Mar) and temperature (Annual average) projections for all IPCC AR4 models, for A1b 2040s. Models included in the ensemble are highlighted in blue and green, those that are not included in the ensemble are shown in gray. 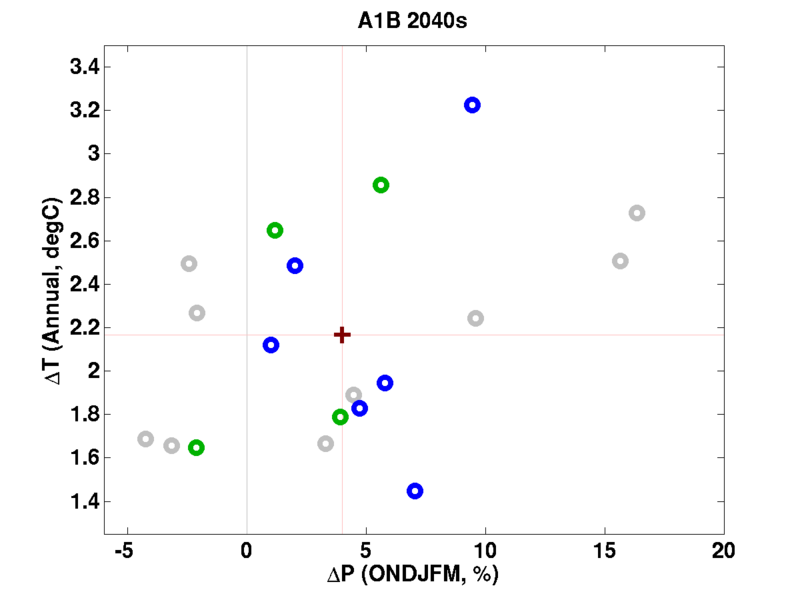 The ensemble average projection is denoted by the plus (“+”) symbol, and the four bracketing models are highlighted in green. This dataset is based on a gridded historical dataset, based on daily weather observations, produced as part of the Pacific Northwest Climate Change Scenarios Project. The historical data span from 1915-2006, and are gridded at a spatial resolution of 1/16th degree (about 5 by 7 km) for all basins except the great basin, which is gridded at a resolution of 1/8th degree. Projections were produced for two future time periods: the “2040s” (average change for 2030-2059) and the “2080s” (average change for 2070-2099), both for the A1B greenhouse gas scenario (a medium emissions scenario; for more details see the GHG scenarios website. The statistical downscaling approach used here (“modified delta”) works by modifying the daily historical record to reflect projected changes in climate. As a result, the future projections have the same sequence of events as the historical dataset, with temperature and precipitation offset to reflect the changes projected for each future time period (for more details, see Hamlet et al., 2010). Projected changes in hydrology are obtained by using a hydrologic model to translate the downscaled changes in temperature and precipitation to changes in hydrology. To do so, we used the Variable Infiltration Capacity (VIC) macroscale hydrologic model (Gao et al., 2010; Liang et al., 1994), version 4.0.7. Simulated changes in hydrology are archived for 23 different variables, including snow water equivalent, soil moisture, potential evapotranspiration, actual evapotranspiration, and runoff (see Chapter 8 in the Pacific Northwest Climate Change Scenarios Project for a complete listing). As with the climate projections, raw model output is at a daily temporal resolution and a spatial resolution of 1/16th degree. Monthly and seasonal averages of the full record (1916-2006) are also archived on a grid-cell basis, both in space-delimited ascii files for the time series files, and in ArcGIS-compatible ascii grid files for the 1916-2006 average. The data are also summarized over Bailey’s Ecosections (Figure 5), Omernik Level III Ecoregions (Figure 6), and 8-digit Hydrologic Unit Code (4th level HUC) basins. In addition, a summary of projected changes in the ratio of spring snowpack to winter precipitation is included for each 5th level HUC, and runoff statistics (e.g., 100-year flood, 10-year low flows) are included for each 6th level HUC. Figure 4. Bailey ecosections in the project domain (left). The green polygons beneath the Bailey ecosections represent USFS lands. Omernik ecoregions in the project domain (right). The green polygons beneath the Omernik ecoregions represent USFS lands. In addition to the downscaled climate and hydrologic projections, observed trends in climate are included for U.S. surface weather stations. Weather station data stem from the U.S. Cooperative Observer (“COOP”) network. Data tables and maps are included, which show trends in minimum temperature, maximum temperature, and precipitation for three historical time frames: 1915-2006, 1950-2006, and 1970-2006. 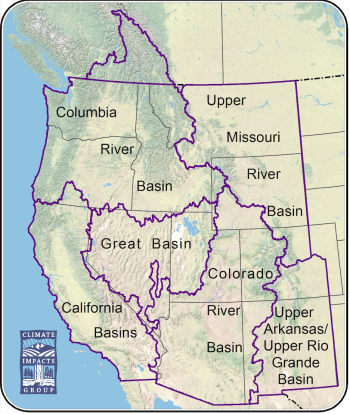 The data are provided for each major basin: CA (California), CO (Colorado), GB (Great Basin), MB (Missouri Basin) and PNW (Columbia). The CIG maintains a database of products from this project that are available at the following links. We would appreciate it if you could send a brief note describing how you plan to use the data (contact information above). Summaries are provided for Bailey ecosection, 8-digit Hydrologic Unit Code (HUC) and Omernik ecoregions (Environmental Protection Agency delineations). This directory contains the same summaries as above, except that the data are organized by variable: each data table contains summaries for all of the above Bailey/Omernik/HUC regions for one variable, month. This is table lists the mean ratio of April 1st Snow Water Equivalent to October to March Precipitation for each 10-digit Hydrologic Unit Code (HUC) domain within the study region. Values are reported for historical as well as each of the 10 future climate scenarios. This directory contains a collection of summaries, focused on a larger region encompassing Yellowstone national park and much of its surroundings in the Northern Rockies. Much like the directories above, these contain regional averages and grid-cell summaries for all projections. Monthly time series files (ascii), along with gridded monthly climatologies (ArcInfo ascii-grid format) for 23 hydro-climatic variables.Data are available for the historical (1916-2006) period, along with 10 future climate projections: A1B scenario, 2040s/2080s, ensemble (or composite, “comp”) and 4 bracketing scenarios (echam5, hadgem1, miroc_3.2, and pcm1). Daily and monthly time series files (ascii), along with gridded monthly climatologies (ArcInfo ascii grid format). As for the full Western US domain, data are available for 23 hydro-climatic variables for the historical period as well as 10 future climate projections. This research was funded through a grant from the US Department of Interior Northwest Climate Science Center. The US Forest Service funded the research for the previous quasi West-Wide hydroclimate project, underpinning this current, more extensive study. The USFS maintains a website that allows users to access the data with a mapping tool developed from the initial study. Raw daily “flux” files have been converted from ascii to NetCDF4 format, making these easier to ingest in ArcGIS and common statistical software packages (e.g., R, matlab, python). These new data are available for download for each scenario. The previous ascii-formatted raw files are still available for download as a zipped archive. A number of fairly minor corrections were applied to the monthly and regional summary data to ensure completeness, consistency, and common formatting. These included applying a common format for the ascii-grid files, ensuring that all monthly and seasonal summaries were present for each variable, and some small modifications to the file naming and organization intended to facilitate navigation. Littell, J.S., M.M. Elsner, G. Mauger, E. Lutz, A.F. Hamlet,, and E. Salathé. 2011. Regional Climate and Hydrologic Change in the Northern US Rockies and Pacific Northwest: Internally Consistent Projections of Future Climate for Resource Management. Report available online here. Christensen, J. H., Boberg, F., Christensen, O. B., & Lucas-Picher, P. (2008). On the need for bias correction of regional climate change projections of temperature and precipitation. Geophysical Research Letters, 35(20). Gao, H., Tang, Q., Shi, X., Zhu, C., Bohn, T. J., Su, F., … & Wood, E. F. (2010). Water budget record from Variable Infiltration Capacity (VIC) model. Algorithm Theoretical Basis Document for Terrestrial Water Cycle Data Records. Liang, X., 1994: A Two-Layer Variable Infiltration Capacity Land Surface Representation for General Circulation Models, Water Resour. Series, TR140, 208 pp., Univ. of Washington, Seattle. Littell, J.S., M.M. Elsner, G. Mauger, E. Lutz, A.F. Hamlet,, and E. Salathé. 2011. Regional Climate and Hydrologic Change in the Northern US Rockies and Pacific Northwest: Internally Consistent Projections of Future Climate for Resource Management. DRAFT report available online here. Littell, J.S., D. McKenzie, B. K. Kerns, S. Cushman, and C. G. Shaw. 2011. Managing uncertainty in climate-driven ecological models to inform adaptation to climate change. Ecosphere 2:102. Available here. McKelvey, K.S., J. P. Copeland, M. K. Schwartz, J. S. Littell, K. B. Aubry, J. R. Squires, S. A. Parks, M.M. Elsner, G.S. Mauger. 2011. Climate change predicted to shift wolverine distributions, connectivity, and dispersal corridors. Ecological Applications. Pre-print available here. McWethy D. B., S. T. Gray, P. E. Higuera, J. S. Littell, G. T. Pederson, A.J. Ray, and C. Whitlock. 2010. 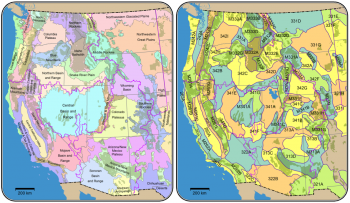 Climate and terrestrial ecosystem change in the U.S. Rocky Mountains and Upper Columbia Basin: Historical and future perspectives for natural resource management. Natural Resource Report NPS/GRYN/NRR—2010/260. National Park Service, Fort Collins, Colorado. McKelvey, K.S., J. P. Copeland, M. K. Schwartz, J. S. Littell, K. B. Aubry, J. R. Squires, S. A. Parks, M.M. Elsner, G.S. Mauger. In press. Climate change predicted to shift wolverine distributions, connectivity, and dispersal corridors. Ecological Applications. Pre-print available here. Salathe Jr, E. P., Leung, L. R., Qian, Y., & Zhang, Y. (2010). Regional climate model projections for the State of Washington. Climatic Change, 102(1-2), 51-75. Salathé, E. P., A. F. Hamlet, M. Stumbaugh, S.-Y. Lee, C. Mass, and R. Steed (2013): Estimates of 21st century flood risk in the Pacific Northwest based on regional climate model simulations. Water Resources Research (in review). Salathé, E. P., J. Littell, G. S. Mauger, S.-Y. Lee, M. R. Stumbaugh (2013): Uncertainty and Extreme Events in Future Climate and Hydrologic Projections for the Pacific Northwest: Providing a Basis for Vulnerability and Core/Corridor Assessments. Project Final Report to the US DOI Northwest Climate Science Center can be accessed here. Wasserman, T.N., S. A. Cushman, A. S. Shirk, E. L. Landguth , and J. S. Littell. In press. Simulating the effects of climate change on population connectivity of American marten (Martes americana) in the northern Rocky Mountains, USA. Landscape Ecology. Wood, A.W., L.R. Leung, V. Sridhar and D.P. Lettenmaier (2004) Hydrologic implications of dynamical and statistical approaches to downscaling climate model outputs, Climatic Change Vol. 62, Issue 1-3, 189-216, January. Salathé, E. P., J. Littell, G. S. Mauger, S.-Y. Lee, M. R. Stumbaugh (2013): Uncertainty and Extreme Events in Future Climate and Hydrologic Projections for the Pacific Northwest: Providing a Basis for Vulnerability and Core/Corridor Assessments. Project Final Report to the PNW Climate Science Center can be accessed here.